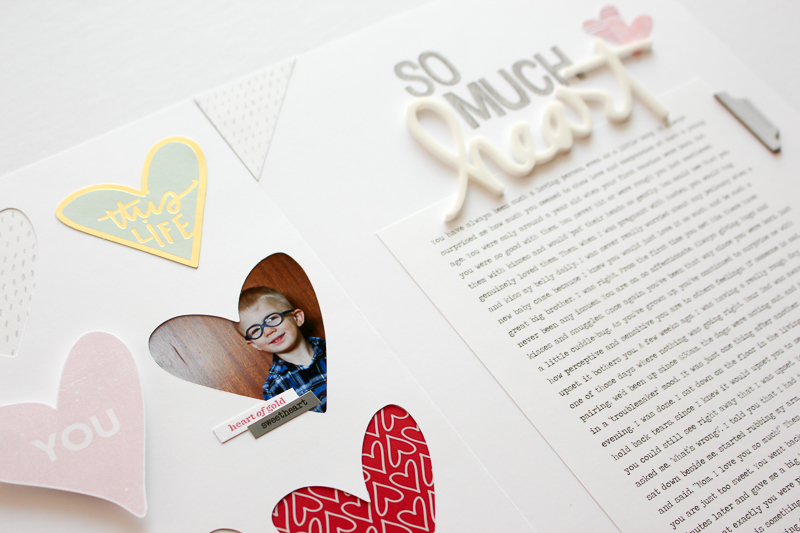 I have really been on a role with Ali's Heart Story Kit! This one was definitely a favourite. I decided to make a layout about my little guy, because he just has the biggest heart. I am always amazed by how sweet, and caring, and perceptive of other people's feelings he is. A real sweetheart, for sure. I went with a 9x12 double page layout, one side with the pictures & embellishments, and the other with my story. I created the heart cut-out template myself, but it is totally inspired by this template from Ali Edwards. Hers just didn't exactly fit what I wanted, so I took the idea and used my photoshop skills to make my own template, then cut it out using my Silhouette. 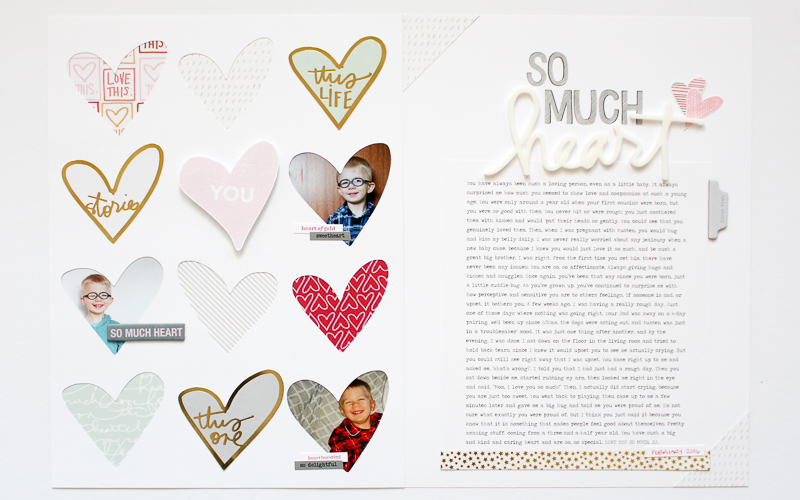 Almost all of the papers and embellishments used on the heart template were from the Heart Story Kit and Stamp, aside from the pink "Heart You" which is from the "Hearts on Fire" set from Ali, and the grey dotted and striped papers, which were just scraps from my stash. 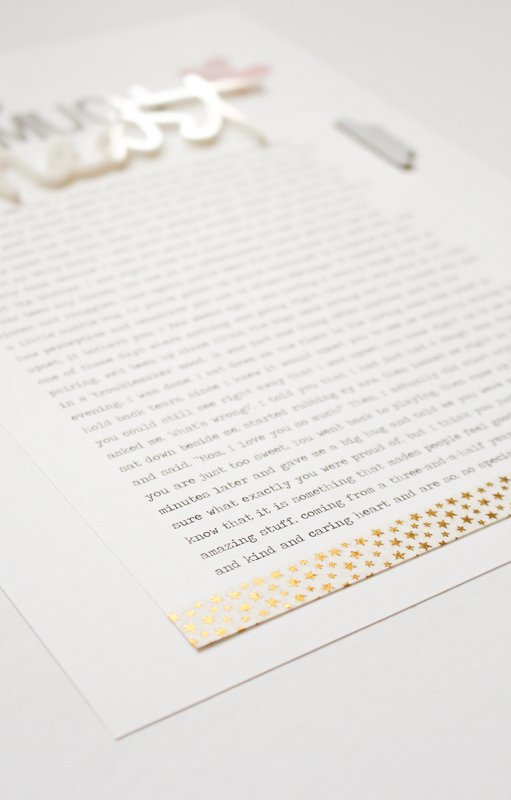 I am quickly running out of those die-cut, gold foiled hearts, and wish I had about 20 more packages of them! I used that awesome gold star washi from from the Week in the Life kit at the bottom of my journaling to add a little bit more dimension to the page. I loved working on this page! Now, I better do some pages on my other son or my husband - don't want to be showing any favouritism! This is a beauty! I love that you were inspired by Ali but made it your own. And I need to nab some of those Amy T Letter stickers. For a flat element, they look really dimensional on your page! Thank you, Jamie :) Yes, I bought a couple packs of those Amy T letter stickers and have been slowly picking away at them. Love them!